The Ibanez GVB1006 Gerald Veasley Signature 6-string bass guitar was created for the renowned contemporary jazz bassist with several features specifically tailored to his style of play. Chief among these is the narrow 14mm string spacing, which allows for playing chords with much more ease. This Signature GVB36 Bass is constructed from a lightweight alder body and flamed maple top, creating an incredibly comfortable performance with a captivating aesthetic. The addition of a maple neck and jatoba fingerboard infuses the 6-String Ibanez Bass with plenty of warmth and brightness, while the custom neck profile provides a smooth playing experience. The Ibanez GWB1005 Gary Willis 5-String Fretless Bass 2018, Natural Flat offers a truly innovative performance, designed to Willis' specifications for an incredible playing experience. Equipped with a single Bartolini GWB pickup, this signature Ibanez bass delivers Gary's signature sound, with its curved design and separate coils offering incredibly precise string balance. Finally, the feel of a high-end bass loaded into an awesomely reasonable priced package. The Ibanez GWB35 sports Ibanez's signature Gary Willis neck shape for an amazing playing feel. It's got a 3-piece maple neck, a comfortably contoured basswood body, and a fretless ebony fingerboard for classic fretless bass sounds. 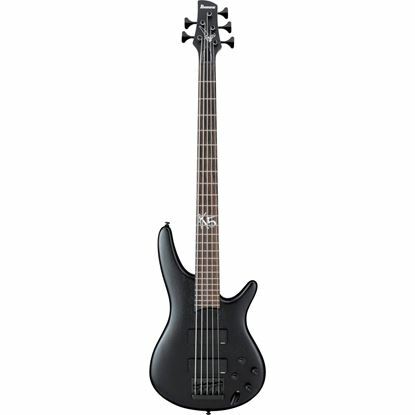 The K5 Fieldy Signature five-string bass delivers all the elements that the Korn bassist needs for his one-of-a-kind style and tone. It all starts with a mahogany body and a durable five-piece maple/walnut neck with rosewood fretboard.